, a French mathematician and philosopher, and one of the greatest geniuses and best writers that country has produced, was born at Clermont in Auvergne, June 19, 1623. His father, Stephen Pascal, was president of the Court of Aids in his province, and was also a very learned man, an able mathematician, and a friend of Des Cartes. Having an extraordinary tenderness for this child, his only son, he quitted his office and settled at Paris in 1631, that he might be quite at leisure to attend to his son’s education, of which he was the sole superintendant, young Pascal never having had any other roaster. From his infancy Blaise gave proofs of a very extraordinary capacity. He was extremely inquisitive; desiring to know the reason of every thing; and when, good reasons were not given him, he would seek for better; nor would he ever yield his assent but upon such as appeared to him well grounded. What is told of his manner | of learning the mathematics, as well as the progress he quickly made in that science, seems almost miraculous, liis father, perceiving in him an extraordinary inclination to reasoning, was afraid lest the knowledge of the mathematics might hinder his learning the languages, so necessary as a foundation to all sound learning. He therefore kept him as much as he could from all notions of geometry, locked up all his books of that kind, and refrained even from speaking of it in his presence. He could not however prevent his son from musing on that science; and one day in particular he surprised him at work with charcoal upon his chamber floor, and in the midst of figures. The father asked him what he was doing: “I am searching,” says Pascal, “for such a thing;” which was just the same as the 32d proposition of the 1st book of Euclid. He asked him then how he came to think of this: “It was,” says Blaise, “because I found out such another thing;” and so, going backward, and using the names of bar and round, he came at length to the definitions and axioms he had formed to himself. Of this singular progress we are assured by his sister, madame Perier, and several other persons, the credit of whose testimony cannot reasonably be questioned. From this time he had full liberty to indulge his genius in mathematical pursuits. He understood Euclid’s Elements as soon as he cast his eyes upon them. 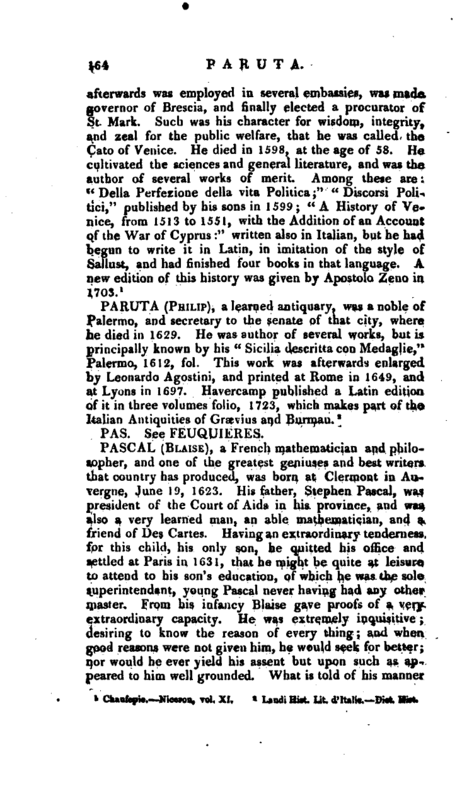 At sixteen years of age he wrote a treatise on Conic Sections, which was accounted a great effort of genius; so much so, that Des Cartes, who had been in Holland a long time, upon, reading it, fancied that M. Pascal the father was the real author of it. At nineteen he contrived an admirable arithmetical machine, which would have done credit as an invention to any man versed in science, and, much more to such a youth. About this time his health became so impaired, that he was obliged to suspend his labours for the space of four years. After this, having seen Torricelli’s experiment respecting a vacuum and the weight of the air, he turned his thoughts towards these objects, and undertook several new experiments, one of which was as follows: havingprovided a glass tube, 46 feet in length, open at one end, and hermetically sealed at the other, he filled it with red wine, that he might distinguish the liquor from the tube, and stopped up the orifice; then having inverted it, and | placed it in a vertical position, with the lower end immersed into a vessel of water one foot deep, he opened the * lower end, and the wine descended to the distance of about 32 feet from the surface of the vessel, leaving a considerable vacuum at the upper part of the tube. He next inclined the tube gradually, till the upper end became only of 32 feet perpendicular height above the bottom, and he observed the liquor proportionally ascend up to the top of the tube. He made also a great many experiments with siphons, syringes, bellows, and all kinds of tubes, making use of different liquors, such as quicksilver, water, wine, oil, &c.; and having published them in 1647, he dispersed his work through all countries. All these experiments, however, only ascertained effects, without demonstrating the causes. 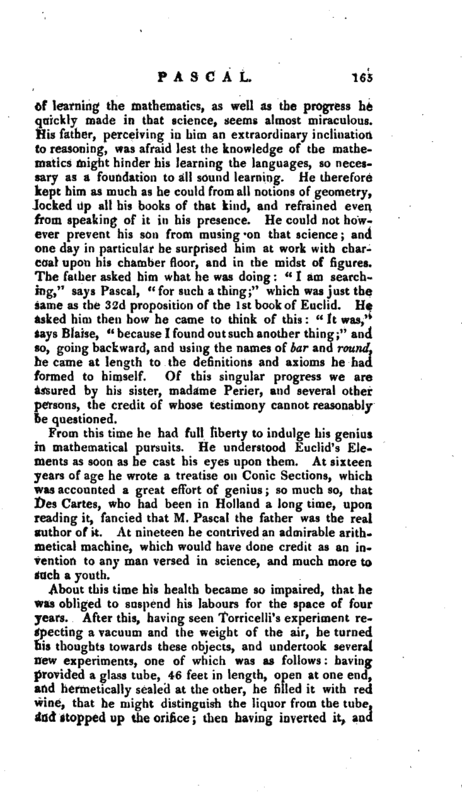 Pascal knew that Torricelli conjectured that those phenomena- which he had observed were occasioned by the weight of the air, though they had formerly been attributed to Nature’s abhorrence of a vacuum: but if Torricelli’s theory were true, he reasoned that the liquor in the barometer tube ought to stand higher at the bottom of a hill, than at the top of it. In order therefore to discover the truth of this theory, he made an experiment at the top and bottom of a mountain in Auvergne, called le Puy de Dome, the result of which gave him reason to conclude that the air was indeed heavy. Of this experiment he published an account, and sent copies of it to most of the learned men in Europe. He also renewed it at the top and bottom of several high towers, as those of Notre Dame at Paris, St. Jaques de la Boucherie, &c. and always remarked the same difference in the weight of the air, at different elevations. This fully convinced him of the general pressure of the atmosphere; and from this discovery he drew many useful and important inferences. He composed also a large treatise, in which he fully explained this subject, and replied to all the objections that had been started against it. 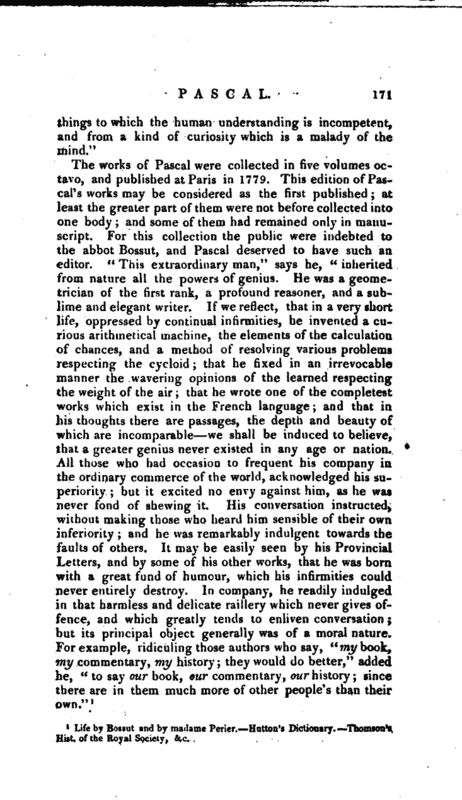 As he afterwards thought this work rather too prolix, and being fond of brevity and precision, he divided it into two small treatises, one of which he entitled “A Dissertation on the Equilibrium of Fluids;” and the other, “An Essay on the Weight of the Atmosphere.” These labours procured Pascal so much reputation, that the greatest mathematicians and philosophers of the age proposed various questions to him, and consulted him respecting such difficulties | as they could not resolve. Upon one of these occasions he discovered the solution of a problem proposed by Mersenne, which had baffled the penetration of all that had attempted it. This problem was to determine the curve described in the air by the nail of a coach-wheel, while the machine is in motion; which curve was thence called a roullette, but now commonly known by the name of cycloid. Pascal offered a reward of 40 pistoles to any one who should give a satisfactory answer to it. No person having succeeded, he published his own at Paris; but, as ie began now to be disgusted with the sciences, he would not set his real name to it, but sent it abroad under that of A. d’Ettonville. This was the la’st work which he published in the mathematics; his infirmities, from a delicate constitution, though still young, now increasing so much, that he was under the necessity of renouncing severe study, and of living so recluse, that he scarcely admitted any person to see him. Another subject on which Pascal wrote very ingeniously, and in which he has been spoken of as an inventor, was what has been called his Arithmetical Triangle, being a set of figurate numbers disposed in that form. But such a table of numbers, and many properties of them, had been treated of more than a century before, by Cardan, Stifelius, and other arithmetical writers. After having thus laboured abundantly in mathematical and philosophical disquisitions, he forsook those studies and all human learning at once, to devote himself to acts of devotion and penance. He was not twenty-four years of age, when the reading some pious books had put him upon taking this resolution; and he became as great a devotee as any age has produced. He now gave himself up entirely to a state of prayer and mortification; and he had always in his thoughts these great maxims of renouncing all pleasure and all superfluity; and this he practised with, rigour even in his illnesses, to which he was frequently subject, being of a very invalid habit of body. Though Pascal had thus abstracted himself from the world, yet he could not forbear paying some attention to what was doing in it; and he even interested himself in the contest between the Jesuits and the Jansenists. Taking the side of the latter, he wrote his celebrated “Lettres Provinciates,” published in 1656, under the name of Louis de Montalte, making the former the subject of ridicule, *< These letters,“sVys Voltaire,” may be considered | as a model of eloquence and humour. The best comedies of Moliere have not more wit than the fmt part of these letters; and the sublimity of the latter part of them is equal to any thing in Bossuet. It is true indeed that the Whole book was built upon a false foundation; for the extravagant notions of a few Spanish i.nd Henmh Jesuits were artfully ascribed to the whole society. Many absurdities might likewise have been discovered among the Dominican and Franciscan casuists; but this would not have answered the purpose; for the whole raillery was to be levelled only at the Jesuits. 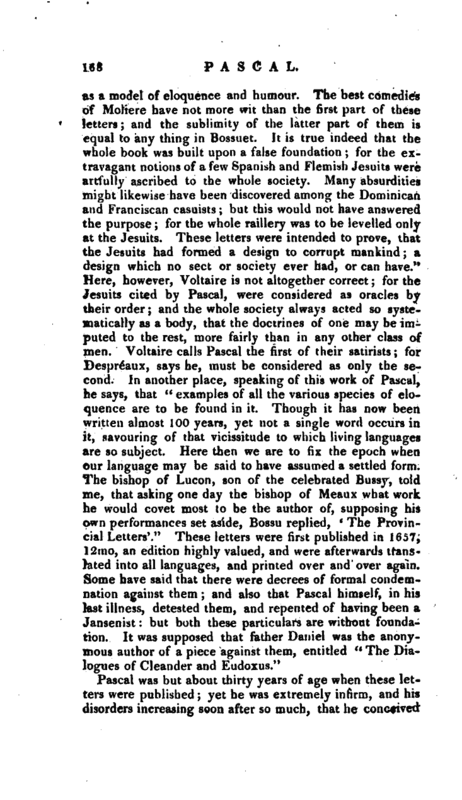 These letters were intended to prove, that the Jesuits had formed a design to corrupt mankind; a design which no sect or society ever had, or can have.“Here, however, Voltaire is not altogether correct; for the Jesuits cited by Pascal, were considered as oracles by their order; and the whole society always acted so systematically as a body, that the doctrines of one may be imputed to the rest, more fairly than in any other class of men. Voltaire calls Pascal the first of their satirists; for Despre*aux, says he, must be considered as only the second. In another place, speaking of this work of Pascal, he says, that” examples of all the various species of eloquence are to be found in it. Though it has now been written almost 100 years, yet not a single word occurs in it, savouring of that vicissitude to which living languages are so subject. Here then we are to fix the epoch when our language may be said to have assumed a settled form. 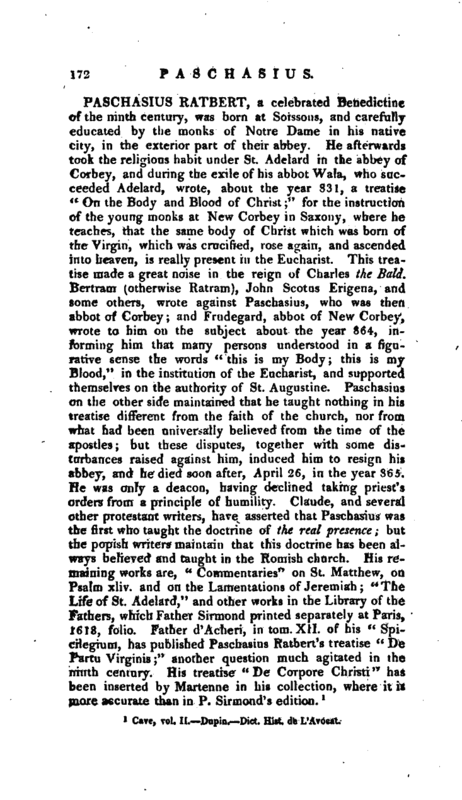 The bishop of Lucon, son of the celebrated Bussy, told me, that asking one day the bishop of Meaux what work he would covet most to be the author of, supposing his own performances set aside, Bossu replied, ‘ The Provincial Letters’.“These letters were first published in 16o7, 12 mo, an edition highly valued, and were afterwards translated into all languages, and printed over and over again. Some have said that there were decrees of formal condemnation against them; and also that Pascal himself, in his last illness, detested them, and repented of having been a Jansenist: but both these particulars are without foundation. It was supposed that father Daniel was the anonymous author of a piece against them, entitled” The Dialogues of Oleander and Eudoxus." Pascal was but about thirty years of age when these letters were published; yet he was extremely infirm, and his disorders increasing soon after so much, that he conceived | liis end fast approaching, he gave up all farther thoughts of literary composition. He resolved to spend the remainder of his days in retirement and pious meditation; and with this view he broke off all his former connections, changed his habitation, and spoke to no one, not even to his own servants, and hardly ever even admitted them into his room. He made his own bed, brought his dinner from the kitchen, and carried back the plates and dishes in the evening; so thrt he employed his servants only to cook for him, to go to town, and to do such other things as he could not absolutely do himself. In his chamber nothing was to be seen but two or three chairs, a table, a bed, and a few books. It had no kind of ornament whatever; he had neither a carpet on the floor, nor curtains to his bed. But this did not prevent him from sometimes receiving visits; and when his friends appeared surprised to see him thus without furniture, he replied, that he had what was necessary, and that any thing else would be a superfluity, unworthy of a wise man. He employed his time in prayer, and in reading the Scriptures; writing down such thoughts as this exercise inspired. Though his continual infirmities obliged him to use very delicate food, and though his servants employed the utmost care to provide only what was excellent, he never relished what he ate, and seemed quite indifferent whether they brought him good or bad. His indifference in this respect was so great, that though his taste was not vitiated, he forbad any sauce or ragout to be made for him which might excite his appetite. 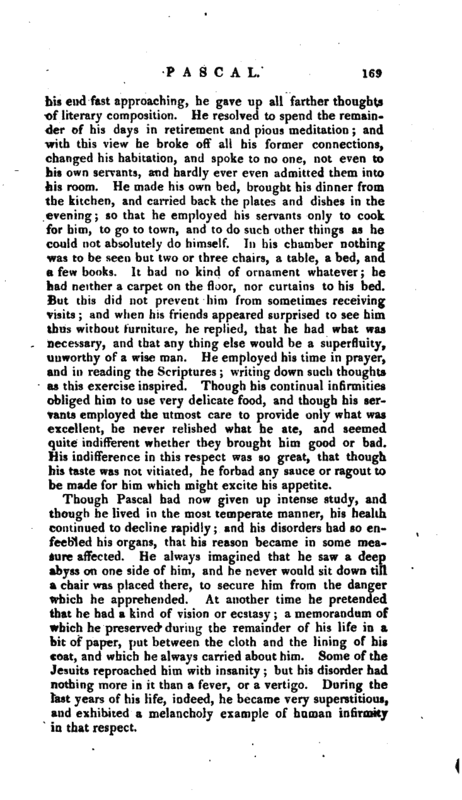 Though Pascal had now given up intense, study, and though he lived in the most temperate manner, his health continued to decline rapidly; and his disorders had so enfeebled his organs, that his reason became in some measure affected. He always imagined that he saw a deep abyss on one side of him, and he never would sit down till a chair was placed there, to secure him from the danger which he apprehended. At another time he pretended that he had a kind of vision or ecstasy; a memorandum of which he preserved during the remainder of his life in a bit of paper, put between the cloth and the lining of his coat, and which he always carried about him. Some of the Jesuits reproached him with insanity; but his disorder had nothing more in it than a fever, or a vertigo. During the last years of his life, indeed, he became very superstitious, and exhibited a melancholy example of human infirmity in that respect. | In company Pascal was distinguished by his amiable behaviour, by his easy, agreeable, and instructive conversation, and by great modesty. He possessed a natural kind of eloquence, which was in a manner irresistible. The arguments he employed, for the most part produced the effect which he proposed; and though his abilities entitled him to assume an air of superiority, he never displayed that haughty and imperious tone, which may often be observed in men of shining talents. Toward the close of hii life, he employed himself wholly in pious and moral reflections, writing down those which he judged worthy of being preserved. The first piece of paper he could find was employed for this purpo.se; and he commonly put down only a few words of each sentence, as he wrote them merely for his own use. 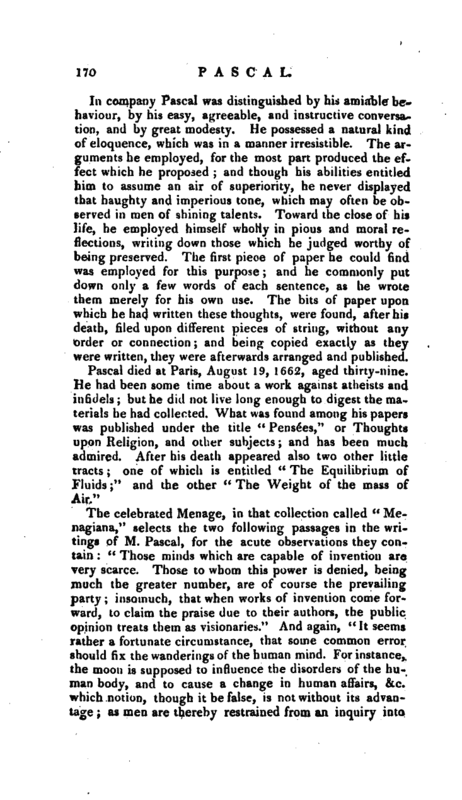 The bits of paper upon which he had written these thoughts, were found, after his death, filed upon different pieces of string, without any order or connection; and being copied exactly as they were written, they were afterwards arranged and published. Life by Bossut and by madame Perier.—Hutton’s Dictionary.—Thomson’s Hist. of the Royal Society, &c.